Users of iOS mobile devices benefit from access to your professional support team. BeyondTrust enables you to support iOS devices, and you may begin this type of iOS device support via a representative-initiated support invitation or from your BeyondTrust support portal. 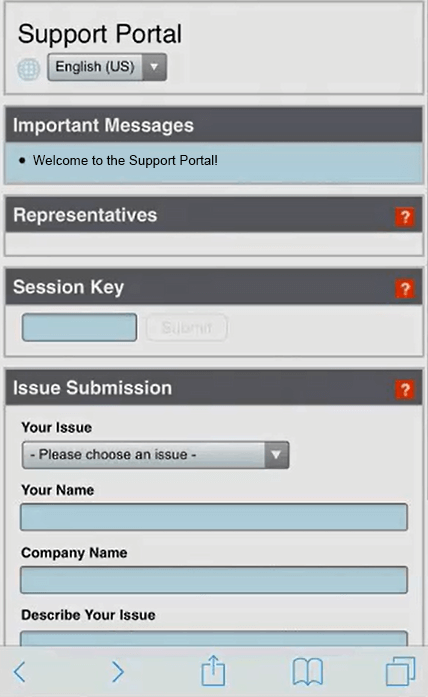 To initiate a support session, the customer must navigate to your organization’s support portal e.g., support.example.com. From this page, the customer chooses how they wish to start the session. The options available on the page are determined by the permissions set within the /login interface. After a session start method has been chosen, the customer is presented with two options, Install App and Start Session. Note that the customer can also open the app by tapping on the Open option in the smart banner. If the customer has the BeyondTrust Customer Client app installed on their iOS device, they may tap Start Session to begin the session. However, if the customer does not have the app installed, they should tap the Install App button. When tapped, the Apple Store opens, allowing them to download the BeyondTrust Customer Client app. When the BeyondTrust Customer Client app is installed on the iOS device, the customer can use this app to begin a support session. Upon accessing the app, the customer is prompted to enter their site address and session key. Both the address and the key are provided when the representative generates the session key from within the representative console. The representative can provide these values to the customer verbally, via email, or via SMS. After tapping Submit, the connection is initiated. The customer may be prompted to accept an agreement and/or allow session information to be recorded before joining the session. You can send an email invitation from the representative console. The email contains an invitation to join a support session along with a unique session key URL.